Here we will build Powerful SEO Link building,SEO Backlinks service which upgraded on 2019,This SEO Link building will help your website ranking. wordpress, Issuu, trello, Mit.edu, Reddit , ted, Academia.edu, will add great credibility and trust to your website. The safe mix of Dofollow and Nofollow, contextual and relevant, anchored and non-anchored, (filling each web 2.0 profile with niche-related content). Full Report with Username, Password and Mail. Q. How Safe Your Backlinks ? A. Most of the links will be dofollow (90%) and only few nofollow. Mix of dofollow and nofollow is always good for link profile. Short time Offer if you buy 3 so i will give you 1 order free. 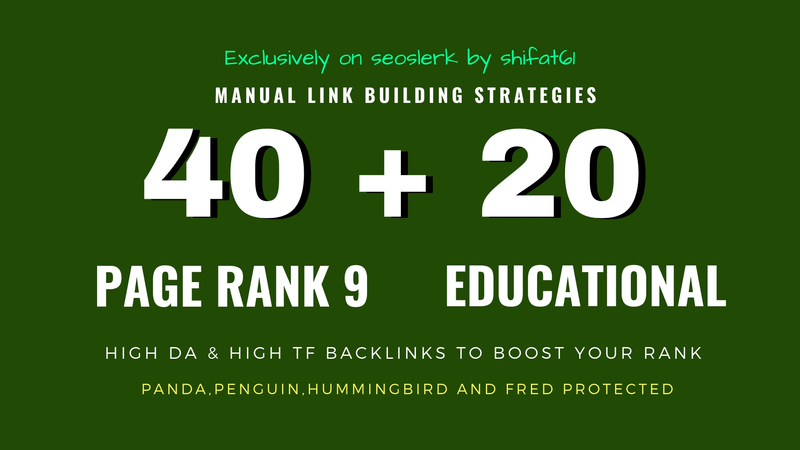 40 Pr9 + 20 Edu Gov High Trust SEO Authority Backlinks is ranked 5 out of 5. Based on 9 user reviews.